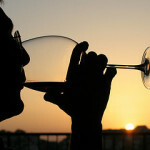 After the astonishing French wines we will take a look into the world of Italian wines. In Italy, the vine is everywhere, from the northernmost city walls to the southern limits of the Italian soil, that is to say from the cold snows of the Alps to the hot sun of the islands. Anyway, the Italians are very proud of their vineyards “Val d’Aoste” (the typical white grape native to the Aosta Valley, the smallest of the Italian regions, in the south-eastern corner of the hexagon), which are over 1000 meters above sea level (the highest in Europe). And even if there are no famous Italian wines produced in Lampedusa, this beautiful island visited by tourists from around the world (this is the most popular in South Italy), one of the most famous Italian wine is still the Passito de Pantelleria. The most famous Italian wine is red wine. If the greatest Italian wines, Barolo, Barbaresco, Brunello di Montalcino, Amarone della Valpolicella are red, it should be noted that Italy also produces white wines of great quality. And if they do not demonstrate yet the ability of aging (with some exceptions) the greatest white wines of France, it is sure that the Italian white wines of today are a hymn to the greatest beverages, fresh and very drinkable like few others in the world. And do not forget the sweet and sparkling wines, which in Italy -as in France-, reach invariable quality peaks or almost as the rest of the wine regions of the world. So the world of Italian wine has been shaked in the last forty years, and almost always for the better (but here too, it will discuss in more depth in future articles) The importance of the barrique and oak french (rather than large pieces of Slavonian oak, often too old and not very clean), the discovery of malolactic transformation, the implementation of pneumatic presses, application of gravimetry, the use of thermoregulation in cellar (and therefore stainless steel tanks), return controling (with thinning and green grape harvest), leaf removal, the choice of most suitable clones, the importance of mass selection, the grape harvest at a better maturity (not only technological but also polyphenol), selecting more attentive berries (vine and also the arrival of the grapes in the cellar, using the tables of sorts, with, or without, vibrating tables or modern optical systems), the importance of a second wine. Above all, the rediscovery of indigenous or local varieties, the true, the enormous, the essential richness of the world of Italian wine. There is a rich heritage, an incredible treasure that even France has reason to envy in the coming years. That said, the great Italian wines are produced only from local grapes, but also from a wide range of international wines. Thus, whereas before Italian wines were mostly very pleasant to drink when they were young (especially the whites), they are now part of the circle of the most famous and most expensive wines in the world. Italian producers have quickly earned the top ranks of global winemaking and there are wines of undeniable class in each Italian region. North and south, and not only in Piedmont and Tuscany (the most famous Italian wine regions known by amateurs), there are real masterpieces. Italian wine today is a “new world” often characterized by great wines because most producers have been able to renew and improve their wines in unimaginable ways during the last forty/fifty years. And it could not be otherwise, because every period reflects its expertise, its technology, its lifestyle. And of course, we can blame many things on Italians, but never the lack of their “art de vivre”. And well-living! For sure, the wine is an essential part of the Dolce Vita. 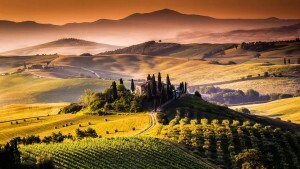 Tuscany, the most important region producing appellation wine in Italy could be compared to Bordeaux in France. It alone represents the symbol of the revival of Italian wines. This revival -which began thirty years ago in the center of the area-, quickly spreaded until the Mediterranean coast, which was only known for it’s wine production until then. Most of the progress came with classical reds made from the local grape Sangiovese, like Chianti, Brunello-di-Montalcino, the Vino Nobile Di Montepulciano and Carmignano, all classified DOCG (Denominazione di origine controllata e garantita). Chianti, produced in eight distinct areas, is still the dominant force in Tuscan viniculture. It has long been considered the “most Italian” Italian wine. This is related on the one hand to the volume produced and the universality of the market, and secondly to its undeniable personality. Its very diverse nature represents the quintessence of Italy. Piemonte (with Val d’Aosta) is the westernmost region of Italy, having borders with France and Switzerland. 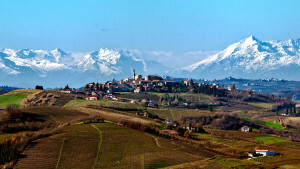 It is surrounded by the Alps and the Apennines. It is a major producer of quality wines VPQRD (DO and DOCG), the second biggest after Veneto. The region has the largest number of DOC(Denominazione di origine controllata) and DOCG (Denominazione di origine controllata e garantita) areas and is proud to have the highest proportion of classified wines. The vast majority of Piedmontese wines are made from local grapes. The noble Nebbiolo is the source of appellations Barolo, Barbaresco, Gattinara and Ghemme, all DOCG. Another popular vineyard Dolcetto di Dogliani Superiore -from the grape Dolcetto-, is appreciated for its round wines. The Brachetto grape variety is gives a red aromatic sparkling Italian wine which is found under the DOCG Brachetto d’Acqui. Finally, Barbera is a very popular red Italian wine, as is the Freisa and Grignolo, and other regional reds. The appellation contrôlée whites still represent nearly one third of the production. First of all the Asti, whose DOCG applies to both the sparkling Asti Spumante Asti as the slightly sparkling Moscato-d’Asti. The wine is not at the top of the long list of Lombard industries. 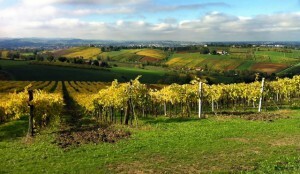 The residents of this wealthy and populous region are rather consumers than producers of Italian wine. Even if the production remains lower compared to the neighboring regions (Veneto, Emilia Romagna and Puglia), Lombards know no less about elaborating great wines. A part of the most important wines are in fact excellent! The reason why the Lombards (especially the Milanese, with eclectic tastes) abandon regional wines remains mysterious. In fact, these regional wines often arrive after the red Piemonte or Tuscany and Veneto white (Veneto, Trentino and Friuli) on restaurant menus. Much of 6 million bottles of red nebbiolo produced annually in the Valtellina is also found in neighboring Switzerland, before the Italians have a chance to taste it. On the other hand, the Lombards show growing signs of pride for their Franciacorta, a sparkling wine produced by the traditional method of bottle fermentation that obtained the status of Denominazione di origine controllata e garantita (DOCG), while the quiet red and white Italian wines red from the same area receive only the denominazione di origine controllata (DOC) Terre di Franciacorta. Emilia-Romagna -as the name implies-, consists of two distinct sectors which meet more or less at the capital, Bologna. To the west lies Emilia, with its prosperous towns strung like beads along the ancient Via Emilia Modena, Reggio, Parma, Fidenza, Fiorenzuola, until Piacenza on the Po. Romagna lies at the East of Bologna with the towns of Faenza, Forli, Cesena, Ferrara, Ravenna and the holiday resort of Rimini on the Adriatic Sea. The wines of Emilia Romagna can be considered the most eccentric of northern Italy (particularly the famous lambrusco, red, sparkling and almost always sweet ! ), different in every respect from those in the neighboring regions, with a rather complacent style but always with a refreshing personality. In ancient times, the Romans admired “Campania Felix”, which they considered as the best wine region. They worshipped the vineyards along the coast of Naples where the product was Falernian, the most wanted wines of the Empire. 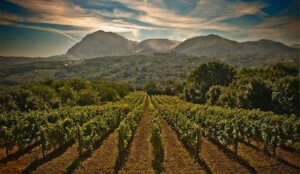 They also appreciated the vineyards of Mount Vesuvius and the wooded hills of Avellino. However, there is little time yet, it seemed that the Campania wine producers (with few exceptions) had forgotten the past glory, since farmers forsook the land and the majority of the winemakers ignored the DOCs. Today, after a long slump, Campania lives a renaissance thanks to which the production quality has improved remarkably. Evidence of this new era is given by the rapid increase in the production of Italian wines DOC, including the first DOCG (Denominazione di origine controllata e garantita) in the south, Taurasi. If the DOC volume product has actually increased in recent years, modernization provided respect for the tradition. In Campania, the majority of growers use local varieties as much as possible, including a prestigious range of “archaeological” varieties, grape varieties that date back to antiquity. In a nation of myriad appellations, Abruzzo offers wine drinkers refreshing simplicity. The DOCs (Denominazione di origine controllata) Montepulciano and Trebbiano d’Abruzzo, longstanding and cover the whole of the region, have been supplemented by the name Controguerra, which includes twelve types of wines. 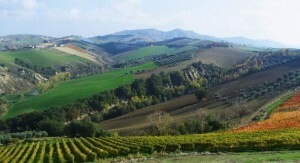 The Abruzzo region, made up of two thirds of mountains and a third of hills, offers particularly favorable conditions for the cultivation of vines. Winemakers have a preference for the Montepulciano (a grape variety close to Sangiovese, not to be confused with the Tuscan town with the same name) and the dominating Trebbiano, while they are also cultivating some highly productive varieties for Italian wines sold in bulk and grape tables. Furthermore they engage in more and more convincing experiments with grapes from the outside. In some parts of Abruzzo -especially in the foothills of the northern province of Teramo (where it is referred to as Teramane Hill name)-, Montepulciano becomes a red wine with irresistible personality, robust and very strong, with a good ability for aging. However, it has such sweetness and such smoothness that it is quite possible to taste it while it is still young. However, “Jarno” must be left aging, which is a tannic and concentrated red (IGT Hill Pescaresi) from the field Podere Castorani. Thank you for joining us for this wonderful journey into the world of Italian wines. If you want to know even more about the top wines, check out our articles about the best Spanish, Portuguese and French wine regions as well.